Larch Cottage Self-cateringNestling in the tiny hamlet of Hawkshead Hill midway between picturesque Hawkshead village and the stunning Tarn Hows, guests who choose Larch Cottage will have the best of both worlds right in the heart of Beatrix Potter country with wonderful walks and rambles from the door and handy for the good local shopping, choice pubs and tea shops in nearby Hawkshead. 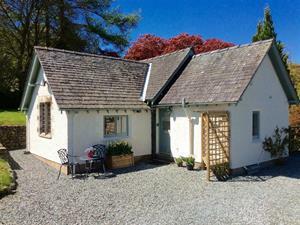 Guests will love this detached 'sleeps two' in its romantic setting away from the madding crowds so if you are a couple looking for a quiet retreat right in the heart of the Lake District this could be the one for you. Come in any season. Don't miss the forest trails in nearby Grizedale Forest ideal for mountain biking, rambling and picnics with wonderful views. A visit to Tarn Hows is a must with its stunning year-round scenery, gentle trails around the tarn and quiet beauty. Hawkshead Hill is perfectly placed for visits to all parts of the National Park and just a short drive from some of our finest high peaks including the Langdale Pikes, Coniston Old Man and Wetherlam. Accommodation: Entrance hallway with room to store your outdoor gear. The cosy sitting room has comfy sofa, dining table, flat screen TV, log effect gas fire and free Wi-Fi. Windows overlook the neighbouring garden and pretty stream tumbling past outside. South facing, good sized bedroom with king-sized bed, two windows and views over the adjoining fields. A door from the hallway leads into the separate, well equipped kitchen. House bathroom (bath with shower over, basin and wc). Main rooms have fitted carpets. Gas central heating and hot water. Outside : The pretty rear garden makes a delightful spot for al-fresco dining with garden table and chairs and delightful country views. Parking for one car. Footpath to Hawkshead 1 mile. Few minutes' drive to the famous Drunken Duck. Larch Cottage offers weekly bookings starting on Saturday.